Comic creators Steve Marchant and Sally Kindberg will be on hand to keep kids happy during this year's Bloomsbury Festival in London. Five years after the first ever Bloomsbury Festival (Friday 21st - Sunday 23rd October, 2011), this annual celebration of one of London's most culturally rich neighbourhoods returns with an eclectic programme of over 150 events, including live music, theatre, dance, walks, talks and food, all of which will be free to attend. Bringing together locally based organisations such as the British Museum, Wellcome Collection, The Place, The Foundling Museum and Faber & Faber with community groups and businesses, the Bloomsbury Festival transforms the streets and parks of the area, inviting visitors to enjoy all that makes Bloomsbury unique. You'll be able to learn how to cartoon with comic artists Steve Marchant and Sally Kindberg at the Cartoon Museum, which is still hosting the Doctor Who in Comics exhibition. (Tying in with that, the Doctor's robot dog, K9 will be at the Museum on Saturday 22nd between 3 and 4.00pm. His keeper Dale has been collecting and making Doctor Who related material for over 20 years and has lots of stories about the Doctors and all their friends). 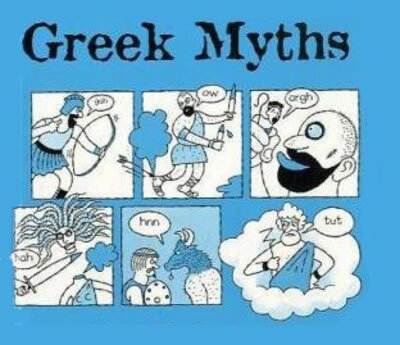 Sally Kindberg's comics workshop is titled 'Mythological Heroes and Monsters' (Saturday 22nd October, 1:30-2:30pm) and is suitable for Ages 6+. An illustrator and writer, Sally uses comic strip frames as ‘little theatres’ and is drawn towards dark humour and velvety black ink. She lives in London, has one daughter and "many robots". Her comic strip books include The Comic Strip book of Space, The Comic Strip History of the World and the Comic Strip Greatest Greek Myths - all with Tracey Turner. "Early influences were Beano and Dandy – Desperate Dan’s creator Dudley D. Watkins was a marvellous illustrator," she says. "I love the way you can give anyone or anything a voice by using speech bubbles, use the frames as little theatres full of surprises, and the way cropping and scale can be almost cinematic. Visual humour is most important too of course." 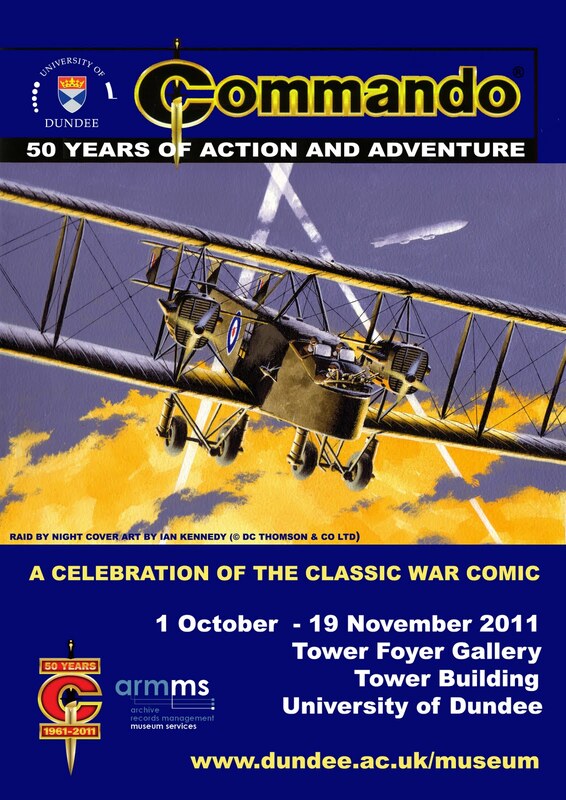 Steve Marchant will be prsenting three 'Get Cartooning' workshops on Sunday 23rd October at the Museum. Have you always wanted to try your hand at cartooning but never had the chance? Come along and be inspired to create your own cartoon faces at one of three 30 minute workshops. For adults and children alike, suitable for all ages from 6+ upwards. One of the founders of Cartoon Classroom, as well as producing cartoons, comic-strips, and two books, for a host of clients, Steve has been visiting schools, libraries and other establishments for over 20 years to teach people of all ages and levels of ability how to write and draw their own comics. "I'm assured that the outcomes of my students' work fulfil several 'key stages' of the curriculum," he says, "by clients and by the Cartoon Museum, where I do a lot of my teaching. The rest of my work with young people takes place in mostly one-off visits, but sometimes as a series of sessions." A weekend of over 150 free arts and cultural events, families will be well catered for by the Festival, with a host of activities for children, in addition to these comic workshops. Other highlights of the Festival include the return of SOAS's hugely popular world music stage, bringing rhythms from across the globe to the crowds in Russell Square, guerilla dancers from the Place popping up throughout the area, and parks transformed with new artistic works from local architecture and sculpture students. There will be a local food market to explore, secret gigs in unusual locations, poetry performances, a magical children's lantern procession, street parties and light and ceramic installations suspended in the area's beautiful and historic trees. Grant's Museum of Zoology also opens its doors for Dino's, Dodos and Dugongs, a tactile exploration of extinct animals. Because all events and activities are free to attend, visitors are encouraged to take a risk on new creative experiences: perhaps delving into the darkness of St Pancras Crypt Gallery for Kalliopi Lemos' eerie art installation, Navigating in the Dark, joining in a riotous night of literary cabaret at the iconic St Pancras Hotel, join a tea party as part of an unusual living art work by Central St Martin's students or participating in a guided exploration of the Garden Squares of Bloomsbury. Other events include the sharing of a new work by Darshan Singh called Caravaggio: Exile and Death, and an immersive theatre performance by students of RADA, inspired by the Bloomsbury Set. Bloomsbury is one of London's most culturally rich corners, with 13 of the world's leading museums and galleries situated along 'Museum Mile' which runs through the heart of the area, including The Brunei Gallery, the Charles Dickens Museum and the Foundling Museum. Bloomsbury is also London's academic hub, with many universities and schools situated here, including leading creative education establishments such as Central St Martins, The Place and RADA. The London Super Comic Convention, announced for February next year (25-26th), is ramping up an impressive guest list, with the likes of US creators George Perez, Howard Chaykin, Bernie Wrightson, Mike Carey, Tony Moore, Bob Layton and more all confirmed as attending. Many top British creators and other International stars will be confirmed within the next couple of weeks, with Brian Bolland, Mark Buckingham, Paul Cornell, Duncan Fegrado, Sean Phillips already announced from the UK - and the team behind the event say they are not even half way through adding all the creators that will be attending. "This convention is shaping up to be the largest American Creator driven convention the UK has seen for two decades," say organisers. With over 600 tables, and Exhibitors traveling from all over Europe and America, stay tuned for the update to the Exhibitors section of the event's web site over the next week, with back issue dealers, publishers, retailers and indie publications from the UK, Europe and America all to be added. With the U.K.shows featuring only a handful of American creators, the organisers of the Convention say they want to put the Super in Convention, and give the UK the next best thing to being at one of the large USconventions, by bringing those creators en masse across the pond. 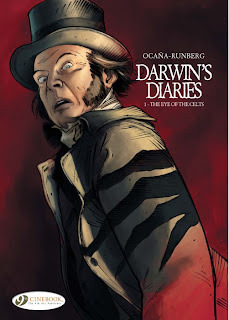 From the writer of the science fiction series Orbital, Sylvain Runberg, comes the start of a new series from Cinebook, Darwin's Diaries. With art from Eduardo Ocana and colours from Tariq Bellaoui, the first diary entry is The Eye Of the Celts. It is 1860 and naturalist Charles Darwin has achieved notoriety with his publication on evolution, enough that when a mysterious creature attacks workmen constructing a new railway in Yorkshire, Darwin is summoned to the Prime Minister and offered a lot of money to investigate. With Suzanne Dickinson, the daughter of the landowner where the attacks have taken place, Darwin begins his investigation of a clawed beast that is fast, strong and very vicious, cutting both men and horses to pieces and that appears to be unknown to science. This is a very new book having only been published in France in 2010 as Les Carnets De Darwin - L'Oeil Des Celtes and, like Runberg's Orbital tales, it is a two parter story so the tale is not complete in this book. However the second book, Death Of A Beast, has already been published in France and is due next year in English so there is not long to wait for the conclusion. 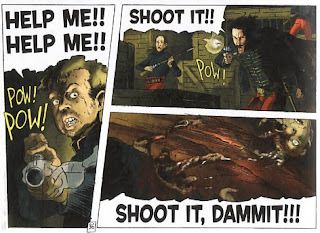 Runberg takes the reality of the time and gives it a slight nudge to one side, taking it to a place similar to where, for instance, Queen Victoria was chased by a werewolf in Torchwood House. 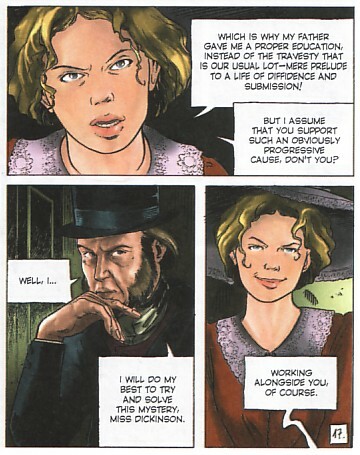 This is an intriguing story with a slow build up as the danger from the creature is spelled out and we discover Darwin's interest in cryptozoology which then leads us on to Yorkshire and the strong female character of Miss Dickinson. 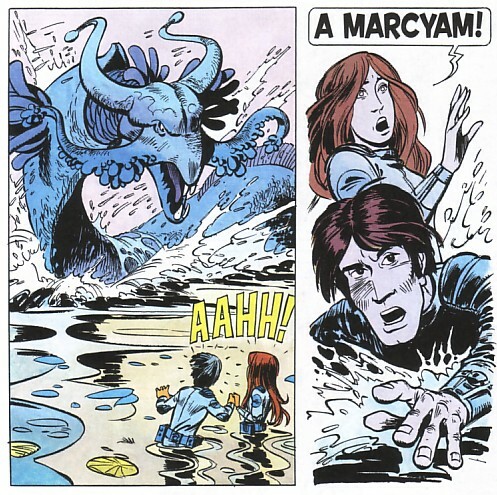 The quiet thoughtfulness of the investigation is punctuated by the sudden and violent attacks of the creature, while other plot threads such as the druid travellers, perhaps the reason for the book's title, and Darwin's nocturnal escapade are left hanging to be hopefully resolved in the second part. The plot is complemented by Ocano's moody artwork which, along with Bellaoui's sensitively dark colours, make for a book that impresses at first glance before even reading any of the text. However it is worth pointing out that Cinebook list it as a 15+ title and it is certainly a graphically gruesome book dwelling as it does on the remnants of the creature's victims as Darwin and Miss Dickinson discuss the case. Runberg displayed his story telling ability in the Orbital books and Darwin's Diaries - The Eye Of The Celts shows that he is equally at home in the past as the future while Ocano's moody artwork does much to enhance the mood of the story. This is an impressive start to a new series and I look forward to the second and concluding part of the story. • There are more details of the French Darwin's Diaries books, Les Carnets De Darwin, on the Le Lombard website (in French). Concluding the Panel Borders radio show's month of war comics coverage and four years of broadcasts on Thursday evenings, Alex Fitch talks to French graphic novelist David B about his new book Black Paths, published by SelfMadeHero, which depicts a little known footnote to the First World War, as the defeated Austro-Hungarian Empire loses control of the city port of Fiume and we meet various eccentric characters trapped within the city walls. 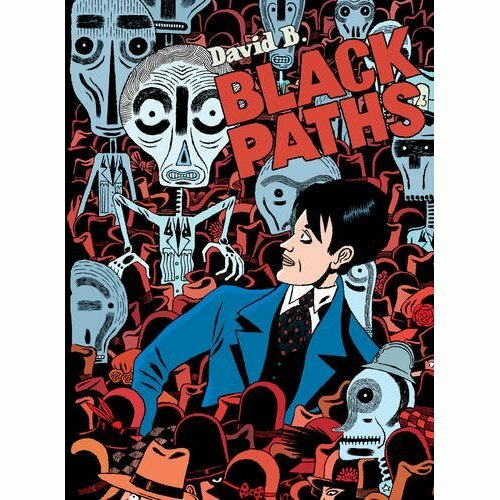 Alex and David also talk about the latter's Ignatz Award winning comic book Epileptic and his work with the independent publishing company L'Association. Starting New British Comics month on Panel Borders in its new Sunday night slot, guest presenter Robin Warren talks to Eric San, better known as Kid Koala, a world-renowned DJ, turntablist and cartoonist hailing from Montreal. 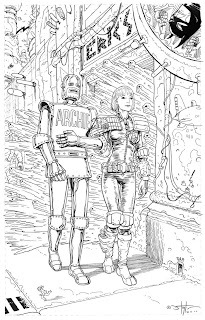 Best known for a series of delightfully odd-ball albums released on the UK Ninja Tune label (often including a free comic book), 2011 has seen the publication of his second graphic novel Space Cadet, a labour of love years in the making, complete with bespoke soundtrack album. The Kid has also been travelling around presenting a series of 'Music To Draw To' events of late, where pens and paper are mandatory accessories and the audience sit around drawing to an 'inspirational' turntable set. Sketchbook in hand, DJ Robin The Fog attended the recent London leg of his tour to talk etch-boards, robots and the Canadian work-ethic. The Scottish Mental Health Arts and Film Festival have been in touch to let us know about three comics related events taking place in Edinburgh and Glasgow in October 2011 as part of their festival. Work with artist Marie-Louise Plum to create a cartoon strip about a day in your life, featuring what you think matters. All participants will have the opportunity for their strip to be exhibited in the centre and/or included in a book. This workshop will take place on Saturday 8 October at 11am at the North Edinburgh Arts Centre, West Pilton, Edinburgh. Admission is free. Spanish artist Paco Roca's vibrant comic has now been translated into a film about a man with Alzheimer's. The screening will be accompanied by a panel discussion about the creative process involved in making both pieces of work. This screening will take place on Sunday 9 October at 5pm at The Old Ambulance Depot, Brunswick Depot, off Leith Walk, Edinburgh. Admission is free. A panel discussion of authors, graphic novelists and poets led by Dr Christopher Murray, of the Dundee Comics Day, on the important role of comics in allowing people in Scotland to dream big and let their imaginations go wild. Covers everything from The Bash Street Kids to Judge Dredd, as well as looking at the more gritty style of contemporary Scottish graphic novels. This discussion will take place on Saturday 15 October at 1.30pm in the Centre For Contemporary Arts (CCA) in Glasgow city centre. Admission is free. There are more details of all the events taking place during Scottish Mental Health Arts and Film Festival on the festival website. 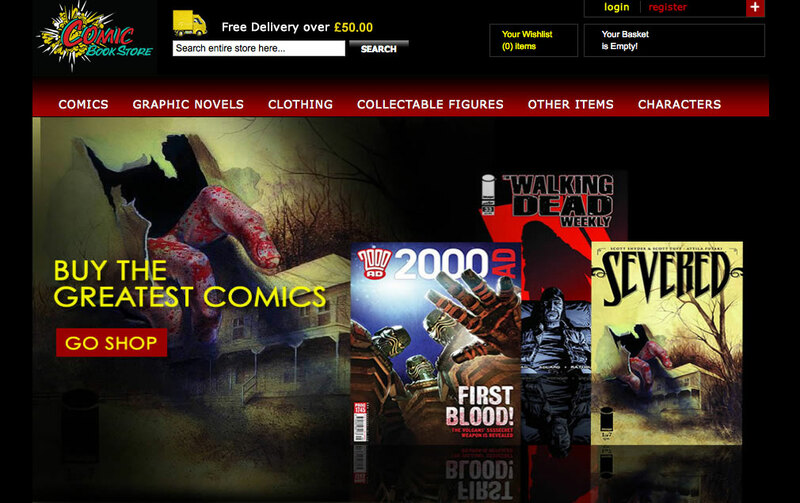 A group of comic fans has launched a new online comic shop which plans to include a specific section for British comics. 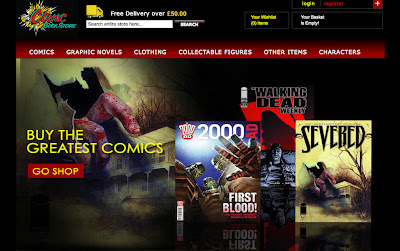 The Comic Book Store (www.thecomicbookstore.co.uk) say they stock everything from 2000AD to The Walking Dead "and everything in-between". "We're a Edinburgh based company, run by comic book enthusiasts only," explains DTT Forum member Jenny McDonald. "The site is ever expanding and our aim is to offer as wide a range as possible in comics and graphic novels, we are also in the process of creating a British Comics only section. "We strive to offer an easy to use site and provide excellent customer service and fast delivery." You can also find them on Facebook, Myspace and Twitter. • Check out our map of British comic shops and UK-based online comic services here. Further information is always welcome. It's also worth checking the web sites of your local comic shops - or indeed the web sites of any of the comic shops mapped - as many also provide mail order services. The fifth annual Dundee Comics Day will be taking place in the Tower Building of Dundee University on Sunday 30 October 2011 as part of the Dundee Literary Festival. This will include the Commando Battlelines exhibition of artwork from DC Thomson's war comic that is celebrating its 50th birthday this year. This free Commando exhibition will be running in the Tower Building's Foyer gallery from 1 October through to 19 November. Tickets for the day cost £10 for adults and £5 for under 13s and are available now from the University of Dundee's online store. There are more details of the event on the Literary Dundee website. 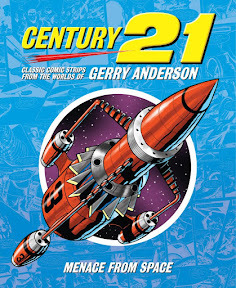 Earlier this year, we revealed Signum Books was continuing the terrific TV Century 21 and Countdown strip collections initiated by Reynolds & Hearn. 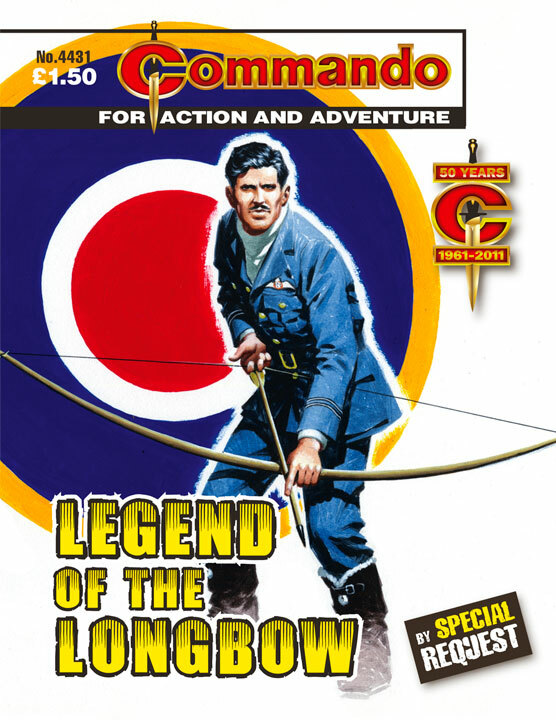 Edited by Chris Bentley, the book features a cover by Doctor Who and Thunderbirds artist Lee Sullivan. Publisher Marcus Hearn also tells us: "We've just uncovered an amazing batch of original Frank Bellamy artboards, so if and when we do another volume we'll be including them." Tharg the Mighty meets Dragons’ Den! 2000AD has just announced its first official convention portfolio session in years – culminating in a Dragons’ Den-style show off! 2000AD has teamed up with the annual Thought Bubble convention , which takes place in Leeds in November, to create a very special event for budding comic book artists. "Tharg demands that budding artists prove their worth before he will let them enter the Galaxy’s Greatest Comic," a Marketing Droid informs us, "and this special portfolio session is not for the faint-hearted!" 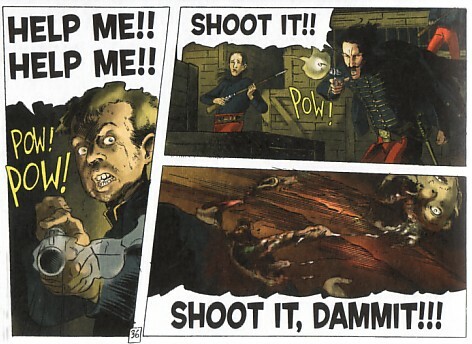 To take part in the first Tharg’s Thrill Challenge, artists should view the free sample five-page script – the Terror Tale ‘Patch Pea Podlings’ by Arthur Wyatt – available on the Thought Bubble website, draw their own version of it, and bring their efforts to the Saturday portfolio sessions being held at the 2000AD stall. 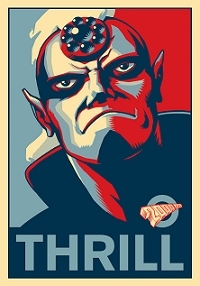 The six best efforts chosen by Tharg himself will then go before a panel on the Sunday, where some of 2000AD’s top-name talent will pass judgement in front of a live audience! Only the brave-hearted need apply, Earthlets. Dare you bring your wares before the searing gaze of Tharg the Mighty?! Four new Commandos go on sale tomorrow (Thursday) - a quartet chosen by readers as their best-remembered stories. "There were more than these 'By Special Request' suggested (far more! )," editor Calum Laird tells us, "but these came up again and again so they made the grade. "We have the chance to do this again early next year so we’ll carry over the other suggestions and throw the floor open once again." It is said that if the British troops at Waterloo had used longbows instead of muskets they would have won the battle far more quickly. 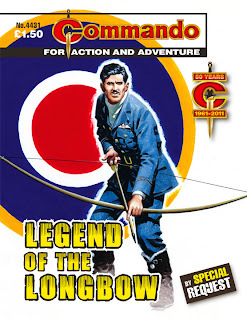 In the hands of an expert the longbow is a fearful weapon with its accuracy, range and rate of fire. And it is almost completely silent. Tim Rollins was an expert, and he passed his knowledge on to his secret group of French Resistance fighters. From now on, not one of the enemy soldiers in his area of France could ever feel safe. 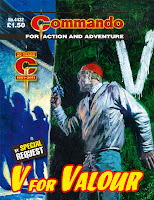 "When I decided to ask Commando’s readers to choose some favourite titles for another airing I wasn’t sure what reaction I’d get," notes Calum in his introduction for this Special Issue. "Would they be interested in the idea, were our stories lodged in their heads and, if they were, would they know their names? "I was not disappointed, though, they came up trumps. Not only did they know all the details they were only too keen to help. In fact there were so many suggestions that we’ll have to do this again. "This story was suggested over and over, so it must have caught the imagination. I wonder how many of you knew it was written by Mary Feldwick, one of our handful of lady contributors? No doubt you recognised Ian Kennedy’s cover artwork, but did you know it was one of his personal favourites. "With inside art by Ibanez, it is obviously a tale to remember." "This classic tale of two very different brothers was a popular request," says Calum. "Maybe it was Gordon Livingstone’s dynamic inside art or the dramatic tension of Penalva’s menacing cover. Or perhaps Cyril Walker’s well-spun plot. Whatever the reason, I enjoyed reading it again and I hope you will too." Since 1713 the mighty Rock of Gibraltar has been British, a massive stone fortress guarding the Mediterranean. But in World War Two, the Nazis had plans for capturing the Rock and knocking out the garrison by using deadly nerve gas. And all that stood in the way of the Germans was one lance-corporal and one small Barbary ape. 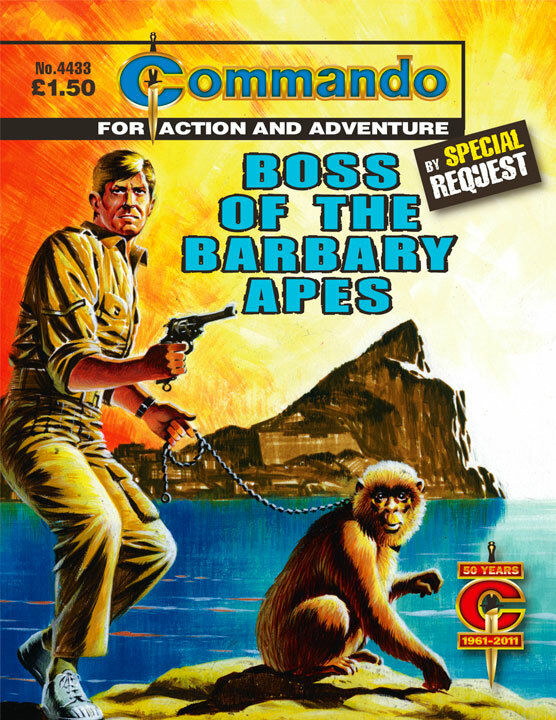 "I was surprised that this title cropped up so often as animal stories aren’t Commando’s most popular line," Calum reveals. "However, with a colourful story by Eric Hebden, an even more colourful cover by Ian Kennedy and inside artwork by Cam Kennedy, it’s easy to see why it was a winner." "In all our readers’ suggestions, several creators’ names popped up over and over, showing how well they’d fired their imaginations." notes Calum. "Jordi Penalva, whose dynamic cover this brings menace and movement to a static picture in a way that was all his own. With a story from the masterly Eric Hebden and illustrations from Franch, this is a classic Commando tale of the burning desire for revenge driving the hero to almost superhuman efforts." Cinebook publish a wide range of Franco-Belgian bandes dessinees adventure albums that they have translated into English, from the adult themed XIII and Largo Winch to the more "all ages" Clifton and Yoko Tsuno. 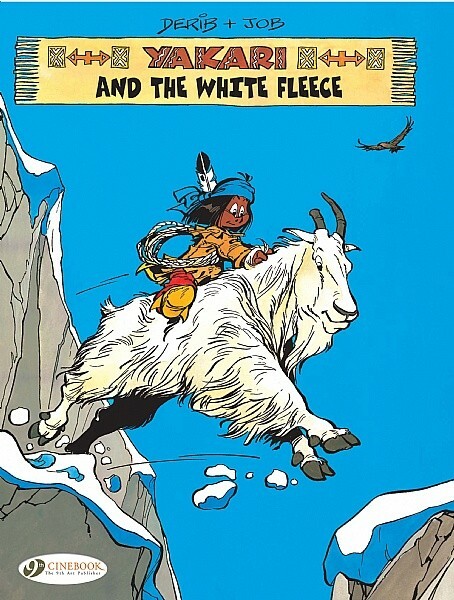 One of their most junior series is Yakari which tells the tales of a Red Indian boy in the time before the white men appeared on the plains and it is written by Job (André Jobin) and illustrated by Derib (Claude de Ribaupierre). The latest album produced by this Swiss team to have been translated into English is Yakari And The White Fleece. Two Lakota Sioux warriors, Bold Crow and Watchful Snake, leave their tribal hunting grounds as Bold Crow attempts to capture a wild stallion. Before he manages to, he is attacked by an eagle which knocks him from his horse and steals his talisman necklace. Watchful Snake returns the comatose Bold Crow to the tribal village where the tribal leader declares that Bold Crow will remain in a coma until the talisman is returned. 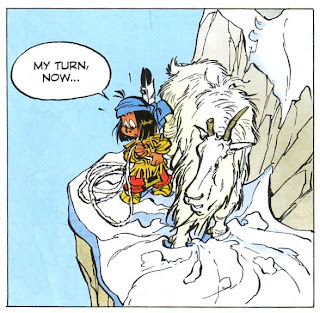 Yakari takes his pony, Little Thunder, and the two set out up the high mountain to find the eagle's nest and to recover the talisman. While they initially think that the bird is Great Eagle, Yakari's totem, they soon discover that it is not and that the mountain animals, while happy to help the pair, are themselves wary of the huge eagle. In the snows at the top of the mountain, it is the brave mountain goat Broken Horn that gives Yakari the most help. Yakari titles have been published in the UK before in the late 1970s when Longman published two books from the series but, as ever, it is Cinebook who have stuck with the series and Yakari And The White Fleece is their eight Yakari title, translating the thirteenth Yakari album, Yakari Et La Toison Blanche, that was first published in France in 1985. 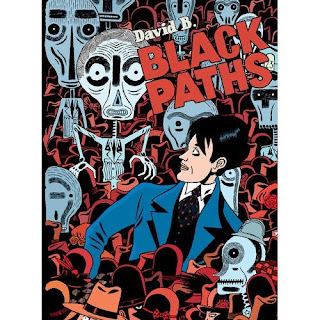 The series has reached it 36th book in France as well as having two different animated TV series based on it. Yakari is very much a series at one with nature and, as the young Sioux boy talks to the wild animals, they talk back to him, from the elk via the marmots to the mountain goats that he meets and befriends as he climbs higher and higher up the mountain. 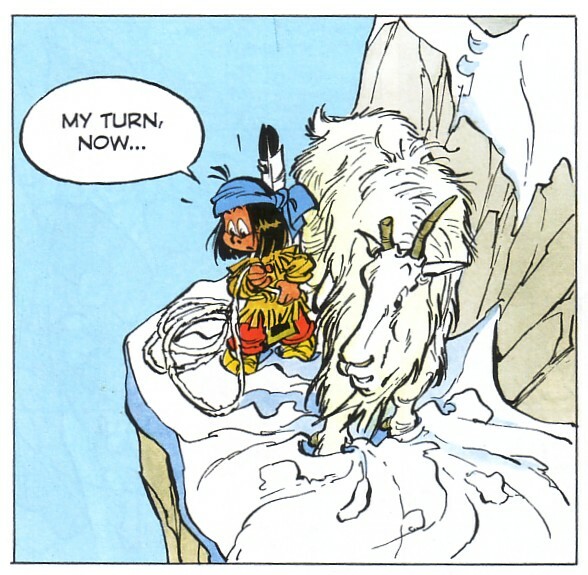 Job's plot is a quest storyline that, while uncomplicated, is never simplistic as the animals help Yakari to overcome his difficulties in climbing towards the eagle's nest, while Denib's artwork is humorous without becoming too tongue-in-cheek for what is, after all, an adventure story. Yakari And The White Fleece with its larger than normal text, uncomplicated plot and friendly artwork, makes for a junior book that is well crafted and should find favour with the younger members of the family. • There are more details of the English language Yakari books at the Cinebook website. The next book in the Cinebook series is Yakari And The Coyote which is due to be published in November 2011. • There are more details of the French language Yakari books at the official Yakari website (in French). Forbidden Planet London has lined up a month of great signings for October that includes a number of comic creators. Here's the gen. All the events below are at the Forbidden Planet Megastore, 179 Shaftesbury Avenue, London, WC2H 8JR unless stated otherwise. Peter F Hamilton, master of space opera and top-ten bestselling author will be signing his short story collection Manhattan in Reverse on Thursday 6th October 6 – 7pm. Legendary games designer American McGee will be signing The Art of Alice: Madness Returnson Saturday 8th October 1 – 2pm. Top director John Landis will be signing Monsters in the Movies on Tuesday 11th October 6 – 7pm. Actor Warwick Davis will be signing his fantastic biography Size Matters Not on Wednesday 21st April 6 – 7pm. A triple signing with Paul Cornell, Gareth L Powell and Justina Robson on Friday 21st October at the Forbidden Planet Megastore, Clifton Heights, Triangle West, Bristol BS8 1EJ. Richard Morgan, the King of noir SF will be signing The Cold Commands, the follow-up to the sensational The Steel Remains at the Forbidden Planet Megastore, Clifton Heights, Triangle West, Bristol, on Friday 21st October from 2:30 - 3:30pm and at at the Forbidden Planet Megastore London on Saturday 22nd October 1 – 2pm. (with thanks to Clive Bryant and Jon Haward): Classical Comics adaptation of Shakespeare's tragedy, Macbeth, is to be re-published in China by its Foreign Language Teaching and Research Press, along with a number of other titles from the successful range. First published in 2008 with art from Jon Haward and Nigel Dobbyn, the artist tells us he is "amazed and pleased" for Classical Comics. FLTRP have produced a two-volume edition for teaching English, with one edition in simplified English and the other in Chinese Language. This allows students to use both to enjoy the story and to learn English better. The English volume is in colour, while the Chinese volume is in black and white. Presenting William Shakespeare's full and unabridged "Scottish play" in comic book form, the British edition was published in three formats - in original and unabridged format, and plain text and quick text editions. Set in 11th century Scotland, the story centres on Macbeth, Thane of Glamis, one of King Duncan's greatest war captains. Returning from a battle with the rebellious Thane of Cawdor, Macbeth and Banquo encounter three witches, who prophecy that Macbeth will become Thane of Cawdor and then King - and so begins a descent into villainy, involving murder, hauntings, suicide and "walking woods". The Classical Comics range has enjoyed plenty of deserved praise since it launched, not least from classical actor Patrick Stewart, who told publisher Clive Bryant he was "fascinated" by the publisher's approach. "I find them gripping, dramatic and, although for me the original Shakespeare is always my reason for turning to these plays, I think that what you are doing in illuminating and making perhaps more lucid, especially for young people, is clever and meaningful." Macbeth has been Classical Comics top seller since its release, Jon tells us. "I'm very proud for the team," he says. "We all worked hard on that book." 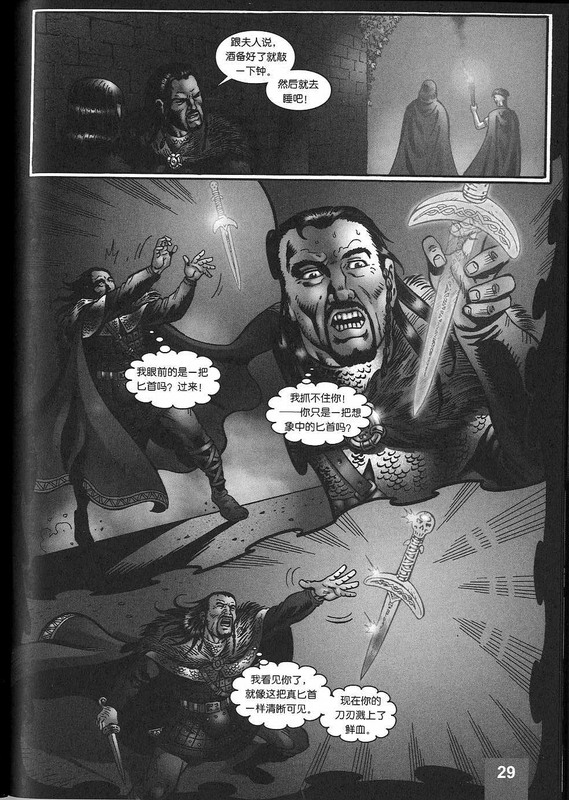 "We're hugely excited about the publications and working with FLTRP in China," publisher Clive Bryant told downthetubes, "and it's thrilling to think that our books are not only helping with the learning of English but are also forming mental imagery of the characters and scenes within these original plays and books. 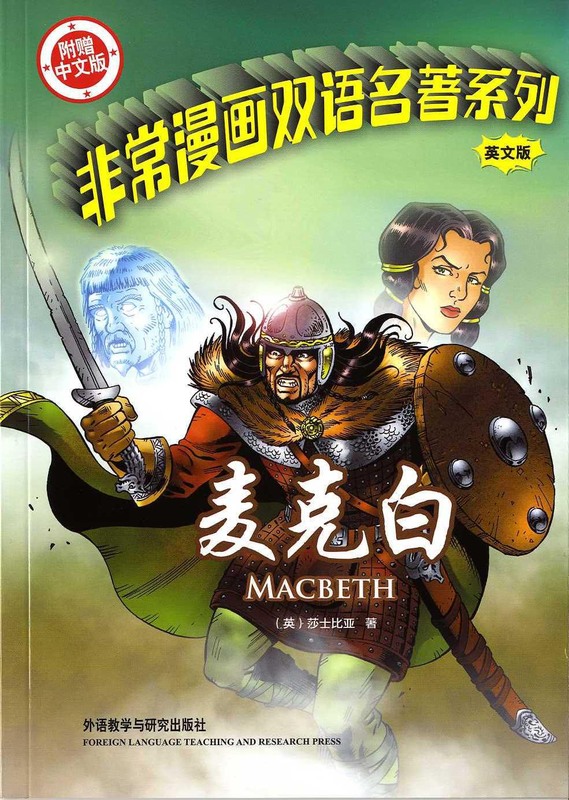 The image of Macbeth drawn by Jon Haward, or Miss Havisham by John Stokes, or Frankenstein's monster by Declan are all entering the minds of Chinese readers. It's mind-blowing!" This isn't the first foreign publishing deal for the title, either. "We have had editions of our titles published in other languages, too - Swedish, Croatian, Turkish and Portuguese, plus we've had a lot of interest from other territories that we are pursuing," says Clive. "Macbeth sold out in Turkey in six weeks and it's now out in Sweden," adds Jon. It's going global, which is fab news, not just for us but for British talent being seen abroad. Awesome, exciting times!" Upcoming British releases from Classical Comics include Staz Johnson's adaptation of Dracula next month, with An Inspector Calls (adapted by Jason Cobley with art by Will Volley) soon after. Next year should see the release of Sweeney Todd (drawn by Declan Shalvey) and The Importance of Being Earnest (drawn by John Stokes, who did a wonderful job on Great Expectations), followed by Julius Caesar: Original Text , with stunning art by Sean O'Connor, inked by Gary Erskine. 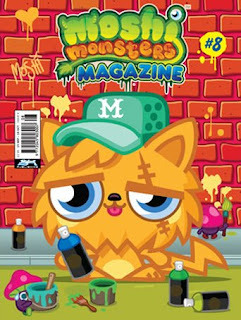 Will the new Moshi Monsters online channel give magazine further sales boost? 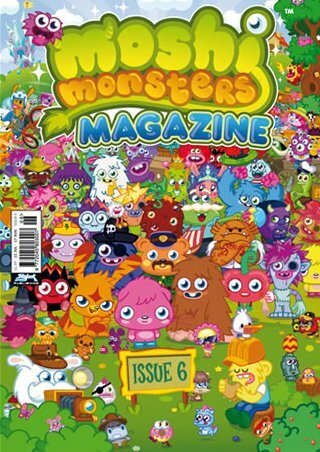 Moshi Monsters Magazine - produced by Britain's Skyjack Publishing for the brand's owners, Mind Candy - will get a further boost to its already-phenomenal sales with the arrival of Moshi TV, a new online channel. 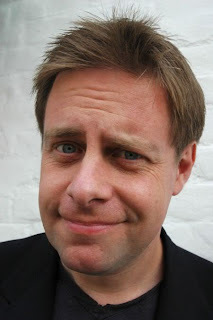 Describing the new channel as "YouTube meets Nickelodeon", Brad Schultz, the newly appointed head of Moshi TV says the UK-based social network, which boasts more than 50 million pre-teen users will launch Moshi TV within weeks. The Guardian reports that while the fine details are still being ironed out, Moshi TV will feature popular "moshlings" such as Dustbin Beaver and Lady GooGoo, alongside animations uploaded by users and syndicated content. Schulz says that traditional rivals, including Disney and the BBC's CBBC, will struggle to keep up with children's shifting viewing habits without an online presence. "Already the traditional TV model has been shattered," he argues. "Video platforms like YouTube are the standard in how kids want to engage with videos. "The role of TV has changed. It used to be the centre of the house and that was your form of entertainment. Now TV is still a place where kids are getting information from, but once they see something on TV they immediately want to find the counterpart to it online. If you don't have that on TV and online, you're done." Alongside an online popularity, Moshi Monsters has also grabbed the attention of fans who are buying Moshi Monsters Magazine in droves, making it the most popular children's magazine in the UK. The magazine has now reached a circulation of 113,748 according to ABC making it the top kids' magazine and one of the top 70 magazines in the UK. Talking about the sales figures last month Emma Munro Smith, co-editor of Moshi Monsters Magazine, said it was incredible to have become the best selling children's magazine in the UK and "to have achieved such large numbers in a previously declining market. "We're delighted with the results and with the incredible feedback we get from our fans... and there's still so much more to come!" Moshi Monsters are virtual pet monsters that are growing in popularity. The website has 50 million registered users worldwide and there are plenty of tie-in real Moshi Monster products including toys, books, trading cards and a video game, which launched in August. Launched in February, the 52-page magazine is packed with Moshi content, including comic strips, competitions, free gifts, puzzles, top secret hints and tips, character fact files and user-generated content. Each issue also includes exclusive giveaways and unique codes that unlock new content within the online universe. Commenting on the launch the CEO of Mind Candy, Michael Acton Smith said, "It's an unusual step launching a print-based magazine to support an established online community, but we think our audience is going to love it." And he's been proven right, suggesting ways forward, perhaps, that other print comics might emulate, armed with a decent online promotions budget. • Moshi Monsters: www.moshimonsters.com - a free-to-play, fun-filled world of adoptable pet monsters. Half of all UK children aged 6-12 have a Moshi Monster – and one new player joins every second! If you want a magazine that comes out with clockwork regularity but doesn't have many jokes, buy The Economist. 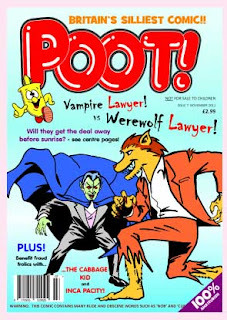 If you want an irregularly-appearing magazine with jokes about flatulence, genitalia, going to the lavatory and other "grown-up" topics, buy Poot! Poot!, which enjoyed a lot of success (and good sales) when it was first published back in 1986 by a group of motley students at Birmingham University, went on hiatus in 1991. In 2009 the title was revived and, although finding the news stand a tough sell second time around, the team behind the title are really working hard to try and promote the revived title. Jim Whittaker tells us Poot!, which has a similar format to Viz but is full colour throughout, is aimed at "students and young professionals" (who are predominantly male but the magazine does has 'approving' female appeal). "We also sell a lot to mainstream mid-life crisis males," Jim says, "mainly travelling business men looking for something light to read on their train back home. "Basically anyone who doesn't take life too seriously and likes a good giggle on the lavvy." Contributors on recent editions include Alex Foulds, John Randles, Royston Robertson and Phil Tonge and many others, although the list doesn't include the core team or the other three main guys involved. ("We're much too modest!" says Jim). Like all humour titles, Poot! isn't going to appeal to everyone but it's clearly gained an audience and loyal following, boosted by the editorial team's social media push and full colour printing, which gives it huge potential. Jim tells us the title is always on the look out for new contributors. "About a third of Poot! comes from amateur cartoonists – and we try to pay every contributor something." 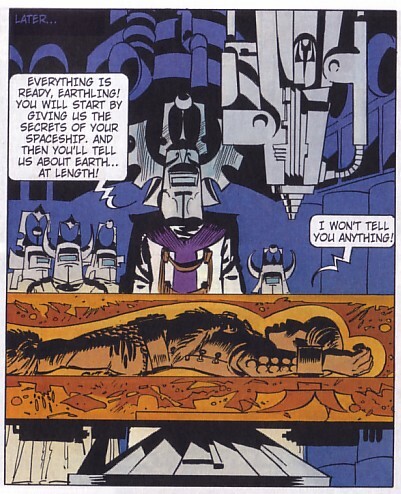 (with thanks to Matt Badham): Many British comic characters may not be getting the exposure these days - who wouldn't want to see new adventures of Steel Claw or Adam Eterno? - but thanks to the web, comic creators can keep these icons alive. Case in point is Someone Old, Someone New - a blog where artists feature old and new British comic characters in one frame of 'What If?' style fun. 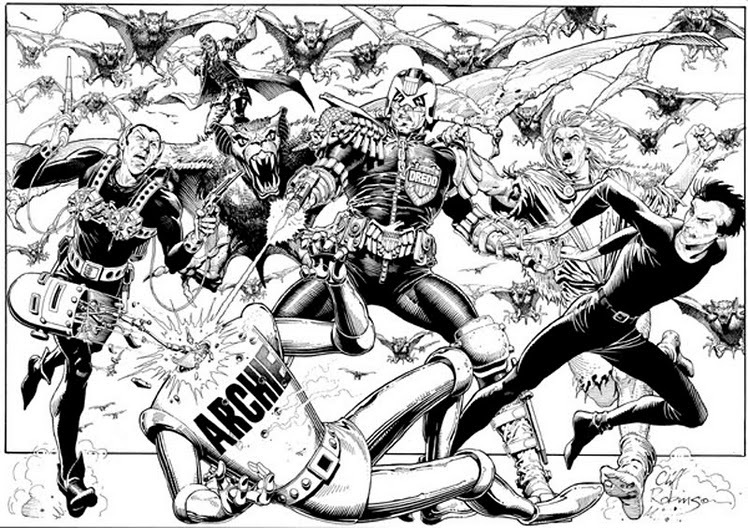 The creation of 'MangaMax', who also runs the AIEEE blog on British comic characters, the brief is simple: ask an artist to depict a chosen classic, long out of print British comic character meeting a modern, in print one. Whether they get along and what they're doing is entirely up to the artist - part of the fun of it seeing just what they'll come up with. The only stipulation anyone is given is that it must be black and white, the natural enviroment of the 70's, apart from that its all down to them. Many artists have already stepped up to the plate, including Cliff Robinson (above, who helped kick the project off), Glenn Fabry, Dave Taylor, Paul Grist and many others. The blog is also a showcase for a slowly growing collection of commissions of Black Max, MangaMax's favourite ever British comic character - and convention sketches of those classic 60/70's strips he love so much. 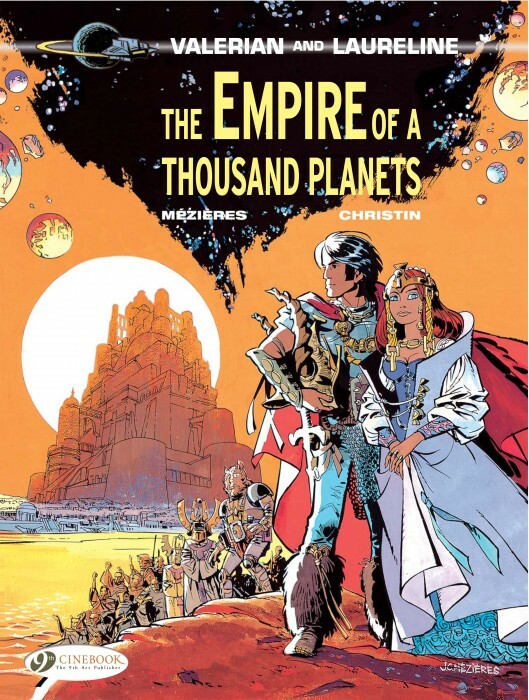 Writer Pierre Christin and artist Jean-Claude Mézières' spatio-temporal agents Valerian and Laureline return in the second book of their series to be published by Cinebook, The Empire Of A Thousand Planets. It is the 28th century and the two agents have been sent to discover if Syrte, the planet at the heart of an empire of 1000 worlds, is a danger to Earth. Working undercover on the planet they discover that the ruling family are remote from the people who instead look to the mysterious masked sect known as the Enlighteneds. Their cover is soon blown and, despite being captured by the Enlighteneds, the pair make their escape into the swamps before returning to the city and meeting up with the leader of the rebellious Merchant Guild. As the Enlighteneds are affecting their trade, the Guild are preparing an attack on the Enlighteneds planet of Slohm and request Valerian and Laureline's help. Christin's plot is a fairly complex affair with the various groupings on the planet being introduced in sequence before everyone heads off to a different world for the final battle, although there are rather too many plot holes when thought about too deeply such as an empire of 1000 planets where space travel is being curtailed or it being extremely distant from Earth but the Earth is worried that this empire poses a threat. However, unlike the previous book, The City Of Shifting Waters, the humour content has been toned back and The Empire Of A Thousand Planets makes for a pleasing, if undemanding, read. Originally published in 1971 as the second of the now over twenty Valerian books, it does rather betray its age in the artwork which has a sixties feel to it especially with its now somewhat juvenile looking spaceship designs. Yet again compared to the previous book, Mézières art is better by leaving the humour behind and treating this book as the straight adventure title it should be. His alien landscapes are interesting and the sheer number of different characters and races that he illustrates are impressive. The Valerian books have an impressive reputation amongst their fans with many seeing echos of Valerian in the Star Wars movies and this book includes a final page of pictures comparing six Valerian frames with Star Wars images. While I can see the similarities, one could point to many other sources that these and other Star Wars images are similar to. Cinebook label the book as 12+ and while some parts are plot and text heavy, I don't really see any reason why it shouldn't be read by children of late primary school age. 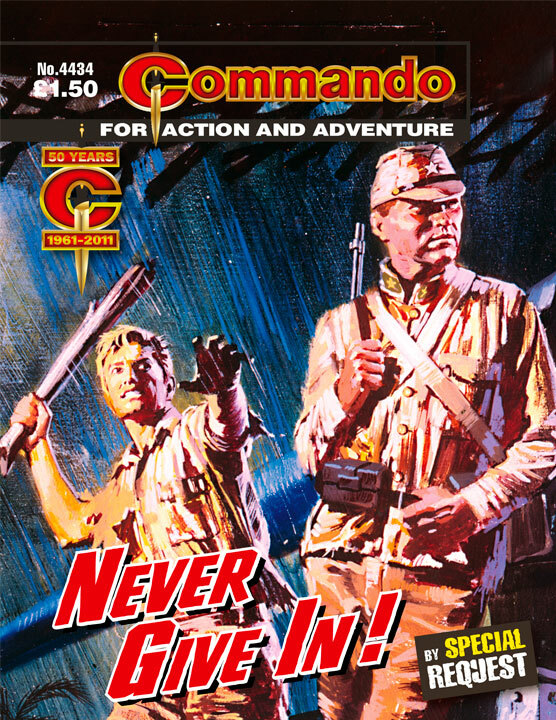 I do wonder however that if the series does get as good as it is supposed to be, why Cinebook just don't skip these early titles and get on to the supposedly better later books - after all they jump around in the original publishing sequence of other adventure titles such as Blake and Mortimer or Yoko Tsuno. Valerian and Laureline - The Empire Of A Thousand Planets is an improvement on the first book and is a good solid read with more than enough to keep a young Star Wars fan entertained for its duration. 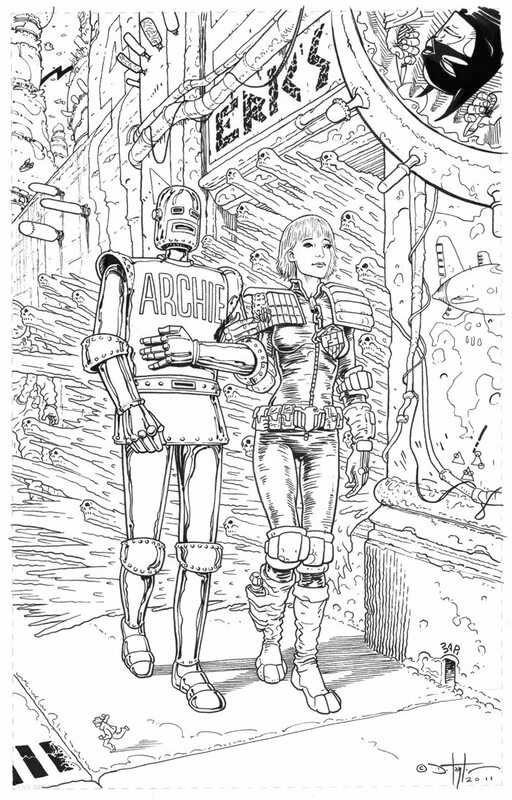 • There are more details of the Valerian and Laureline books on the Cinebook website. • There is more information on the Valerian books on Jean-Claude Mézières official website (in English). 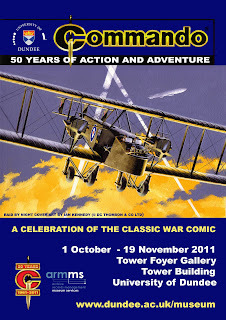 • Jean-Claude Mézières will be appearing, in the company of artist Dave Gibbons, at the BD and Comics Passion event at the Institut Francais in South Kensington, London on Saturday 8 October 2011. There are mores details of the event and how to book tickets on the Institut Francais website. The successful first Glasgow Comic Convention, held at the Mackintosh Church Arts And Heritage Centre in Maryhill, Glasgow in June 2011, featured the presentation of the first Scottish Independent Comic Book Awards (SICBA) during its evening party. Winners included the graphic novel Burke And Hare, its writer Martin Conaghan, and artist Alex Ronald for the Wasted strip Vampire Vixens Of The Wehrmacht. 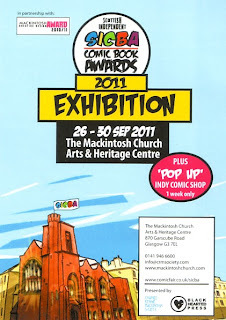 This coming week, 26 to 30 September 2011, the Mackintosh Church will have an exhibition highlighting the SICBA nominees and winners as well as a 'pop up' comic shop in the centre's shop. The centre is open from 10am to 5pm. There are more details of the Mackintosh Church Arts And Heritage Centre at their website. There are more details of the Burke and Hare graphic novel on its website and more details of the Vampire Vixens Of the Wehrmacht on its Facebook page.